After spending a few months listening to Psychic, the debut LP by Darkside, there’s a bit of cognitive dissonance in seeing the humans behind the album’s songs. 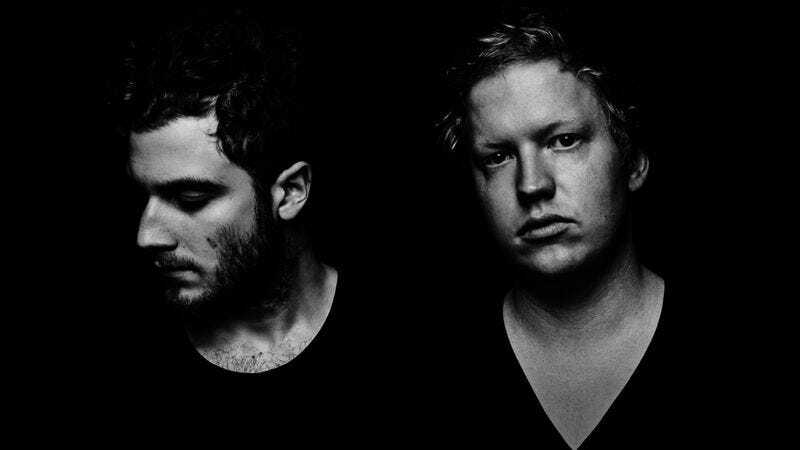 The collaboration between Nicolas Jaar and Dave Harrington isn’t one for mystique-cultivating disguises or blurry press photos, but it was still odd to see Harrington bent over a guitar, wringing out spacey noise at the Metro in Chicago. The interplay between Jaar and Harrington is evident on Psychic standouts like “Paper Trails,” but it comes to the fore in the duo’s live show. Onstage, it’s clear that the call-and-response between warped vocals and bluesy riffs results from more than a few perfectly timed samples. Darkside’s performance chops are the ultimate expression of its inventive, elegant blend of old and new pop worlds. (They also make it easier to explain how a group with one full-length and one EP to its name was able to sell out a space the size of the Metro on its first Chicago stop—a new pop-world phenomenon that’s less surprising with each passing year.) “Paper Trails” rises from that blend, projecting witching-hour mood and speaking through the murk of Jaar’s electronics. There’s a chorus and verses—and Harrington’s guitar squeals out quite the bridge—but the track is more soundtrack excerpt than song. It’s the kind of thing that packs a rock club in 2014, but it could’ve been the sound of a post-bust comedown for Crockett and Tubbs in 1984. In truth, it’s just two guys, filling increasingly larger venues with an impressive amount of sound. And they’re doing so in a way that’s actually compelling to watch. Darkside’s current onstage setup includes a massive mirror that hangs behind Jaar and Harrington, throwing off unpredictable shapes and reflections as it rotates. But none of those forms is as striking as the sight of two guys, locked into each other and into the music they’re making together.